Who does not love the confluence of coding and music? I know I do and live coding adds a performance element to the process. Live coding involves writing code that is producing music from scratch and editing and changing the code as the music develops. There are an increasing number of languages available for live coding. The above example is Sonic Pi which is probably the easiest to start with as it comes as a ready to go app and does not require any faffing around in the Terminal etc. Others include ChucK, Alda, Extempore which grew out of impromptu (Mac only) etc. There is some debate as to whether graphical languages count as coding but I say they do so that is the end of that debate. Who does not love mangling some noise with some new Audio Units? I know I do and my Downloads folder is invariably over flowing with Wiggles, Moniques, Hats and the like. 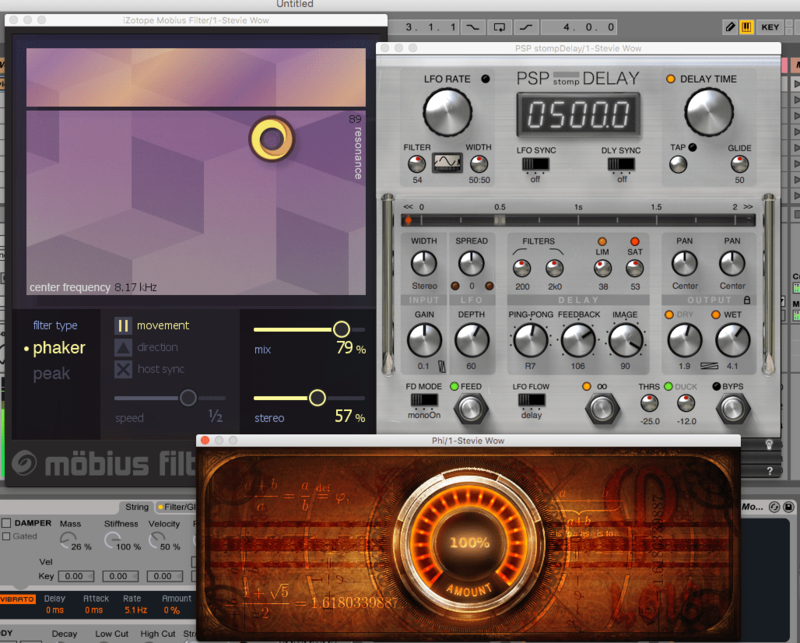 The latest batch included Izotope’s Mobius Filter, PSP’s StompDelay and WavesFactory’s Phi. The first adds a flanging, phasing, equalisation type effect within a simple and effective interface. The second provides a plethora of settings for delays, echoes, loops and related effects. The third utilises the universal Golden Ratio (hence the name Phi) and applies that to enhance even the most mundane recordings. There is probably no type of audio that would not be greatly improved with the use of this plugin. Only one of the three was released on April 1st 2016.